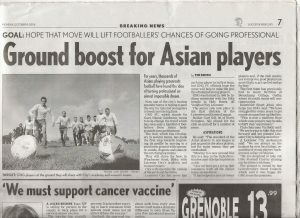 For years, thousands of Asians playing grass roots football have found the idea of turning professional an almost impossible dream. Now one of the city’s leading amateur teams is hoping to pave the way for talented youngsters to break into the big time. GNG FC, which stands for Guru Nanak Gurdwara, wants to help change the trend which has seen only a handful of footballers from Asian backgrounds turn professional. The club which has 150 players in several teams, has made the first step towards improving its profile by moving to a plush new ground with spectator stands, dugouts and state-of-the changing rooms. they will share the base in Winchester Road, Blaby, with Leicester City’s academy and Women’s Teams. We are always on the lookout for new local talent, regardless of young player’s background, colour or religion. We are delighted to help out GNG Football Club by sharing our facilities with them. The ground is owned by the Leicestershire Scout Council, which said it was happy for GNG to use the premises.